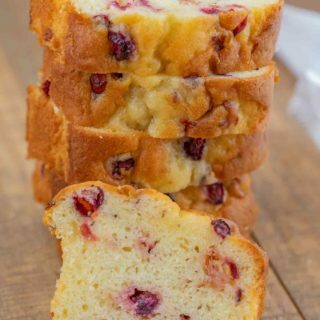 Cranberry Bread made with a buttery cake base and a cup full of cranberries this is an easy festive cranberry dessert! Preheat the oven to 350 degrees and butter and flour an 8x4 inch loaf pan. In a separate bowl sift together the flour and baking powder before adding it into the stand mixer on low speed, alternating with the milk until just combined. Stir the cranberries in by hand until just combined and pour into the pan and bake for 60 minutes until a toothpick comes out clean.